Sometimes, you get a Steve Gerber comic that’s almost too weird for Steve. 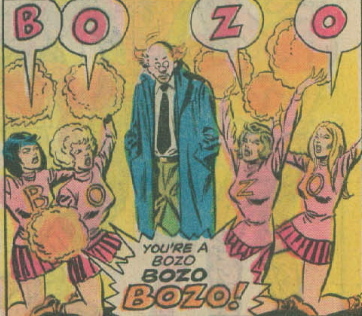 “I think we’re all bozos in this book!” is such a story. From last issue, Jack Norriss, Barbara Norriss’ husband, is still in Nighthawk’s body, which in and of itself is pretty interesting since Barbara Norriss doesn’t exist anymore since her body is being occupied by Valkyrie. Val is looking over Jack’s comatose body and having an internal conversation that, in the 1970s, would normally be depicted with thought balloons. But since it’s dialog balloons, Dr. Strange can hear her and advises her to use bubbles not balloons. Kind of. Anyway, I thought it was kind of funny. One thing about modern comics: All interior conversation is now in boxes at the top of panels, if there is any at all. I think it’s because they’re trying to make comics look like movie storyboards, and very few movies have voiceovers anymore. I don’t like it. I like the balloons. Anyway, the enemy here is the godlike Nebulon, who is trying to be seen in a positive light by humans so he disguises himself as a glasses-wearing nebbish. Also, he put Headman Chondu’s brain in a deer. This is what I mean about weird Gerber. At the same time, we see Hulk destroy a bystander’s home, and the guy is literally crying because he can’t afford to rebuild, and some regular humans call Dr. Strange a racist for treating Wong like a “Chinese slave.” Gerber had the ability to draw out the flaws in his characters, and even punch them up. It was one of the many really nice and interesting things about him-he wasn’t afraid of complexity in characters. In the end, Nebulon gets frustrated with humans and turns them all into bozos before zipping off into the atmosphere. WHY AREN’T YOU READING D.C.’S PREZ?